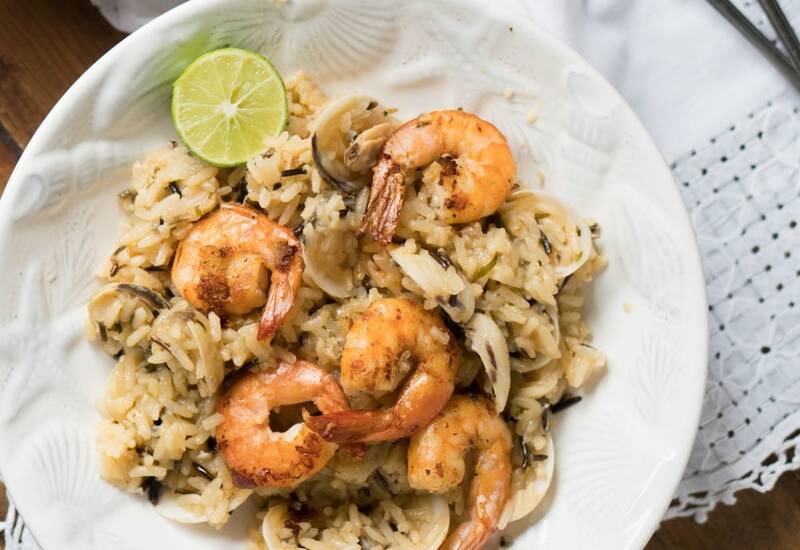 Think of this shellfish and wild rice recipe as a cross between a paella and a risotto. The results are a creamy and incredibly tasty seafood dish. Onion, garlic and fresh tarragon are sautéed together before adding wild rice and white wine to the pan. Then, boiling water is added to cook the rice in this flavorful broth you have created. Clams are added to the pot and cooked until their shells open. The dish is topped with garlic shrimp and dinner is served! Serve this delightfully garlicy dish sprinkled generously with chopped parsley which is a natural breath freshener! It also adds a beautiful burst of color to the presentation. Per Serving: 644 calories; 17g fat; 27.0g carbohydrates; 86g protein; 391mg cholesterol; 3957mg sodium. So I've never been good with making paella unfortunately, but this dish is like an easy, mock version of it with risotto vibes. This was definitely a winner with my friends and I. The white wine gives off the classic notes of risotto and I'm here for it. This paella and risotto hybrid was creamy and delicious. Wild rice is always a good choice! I didn't add clams, but I did pair it with shrimp and it was really good. Simple and easy to make, which I love.